Lawrence Livermore National Lab (LLNL) researchers took to the New York City subway system May 9-13 to study how a surrogate for a biological agent, such as anthrax, might disperse throughout the nation’s largest rapid transit system as a result of a terrorist attack or an accidental release. As part of a multi-agency test sponsored by the Department of Homeland Security Science and Technology Directorate, led by MIT Lincoln Laboratory with assistance from Argonne National Laboratory, a field team led by LLNL scientist Elizabeth Wheeler supervised the release of a harmless DNA-infused aerosol in Grand Central Terminal and two other major subway hubs, and helped collect environmental samples of the particles. The data recorded during the study will give scientists a better understanding of the spread of airborne contaminants in the subway system and provide first responders with better pre-planning strategies and risk assessment in the event of an emergency, said LLNL’s Associate Program Manager Ellen Raber, who headed the overall effort. The odorless aerosol spray used for the tests, called DNATrax, is made of a sugar commonly used as a food additive, and a small amount of synthetic DNA generally regarded as safe by the Food and Drug Administration. It was developed at LLNL for evaluation of biological detectors, and has since been licensed to a company that is using it for food labeling purposes and to trace food back to its place of origin. After releasing the tracer particles over a 20-minute period each day, researchers took particulate and gas samples from more than 50 subway stations, to determine the amount of materials that settled on the ground, inside subway cars and other surfaces. The thousands of samples taken during the tests will be analyzed at LLNL by protocols developed at the Lab and used to validate and improve existing bio-attack models. 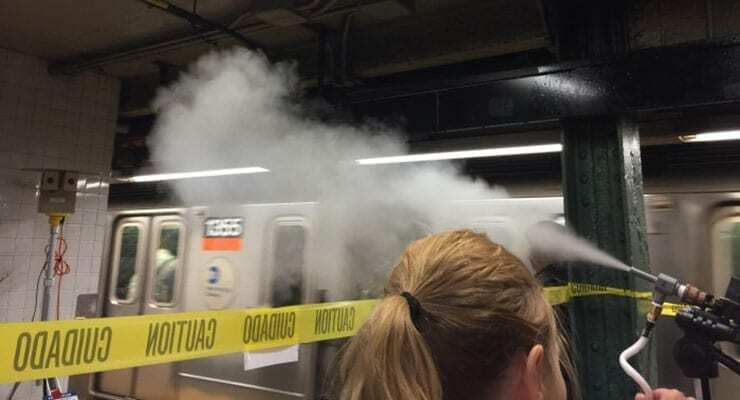 The multi-agency tests, supported by the Metropolitan Transportation Agency New York City Transit and other local agencies, were co-funded by the DHS Office of Health Affairs and First Responder Group. The Environmental Protection Agency had a significant role in the effort. The tests were the first comprehensive study of its kind performed on a major subway system during normal operating hours and could have applications to other subways in the future. The DHS-sponsored effort also involved input and research from DOE national laboratories, including Argonne, Sandia, Pacific Northwest, Lawrence Berkeley, and Brookhaven as well as MIT Lincoln Laboratory. LLNL physicist Matthias Frank, who worked with MIT Lincoln Lab on designing and testing the particle release devices and helped characterize the materials used for the study, said he was pleased with the success of the tests and the response by police, government representatives and the general public. The study is part of a five-year DHS project called Underground Transport Restoration (UTR) and was conducted in accordance with the National Environmental Policy Act. Article courtesy of LLNL, adapted.